Lincolnshire-based Red Arrows are set for a major tour of Asia with performances in China, India, Malaysia and Singapore, it has been announced. The tour, to support Britain's prosperity, is part of performances in up to 20 locations from the Middle East to the Asia-Pacific. It will see the Red Arrows, who are based at RAF Scampton, perform their world-famous aerobatics in China for the first time ever. Planning is under way to finalise details of deployment, which follows an invitation for the aerobatic team of Hawk T1 aircraft to perform at the Zhuhai Airshow as part of the UK’s GREAT campaign. Our RAF Red Arrows and Typhoons represent the best of British. The Red Arrows will fly the flag for Britain in key export markets while our RAF Typhoons will exercise with our allies. The Lincolnshire based Red Arrows were one of the many highlights at the Queen's 90th birthday celebrations today. The Aerobatic team from RAF Scampton were part of an RAF fly-past at Buckingham Palace, thrilling the Royal family on the palace balcony - and the thousands of spectators who lined the Mall. It followed a Trooping the Colour event in Horse Guards Parade. The Red Arrows aerobatic team has been given formal approval to perform in public this year. The Red Arrows have performed a flypast over Tirana in Albania. It is the first time the aerobatic team has visited the country. The Red Arrows took off from their Lincolnshire base to perform the flypast over Twickenham before the final of the Rugby World Cup. 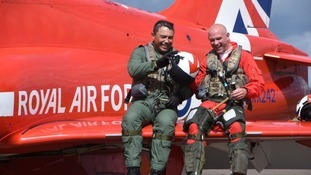 There is to be a change of crew at the Red Arrows, with two pilots stepping down - as another pair prepare to take to the skies. The famous nine, based at RAF Scampton in Lincolnshire, have now completed this season having displayed 65 times in four countries. Calendar has been speaking exclusively to the two that are leaving. 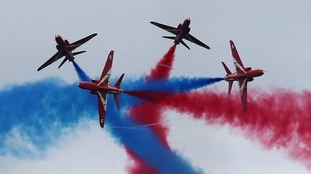 Following the Shoreham air crash, the Civil Aviation Authority (CAA) has amended the display permissions for the Dartmouth Royal Regatta so that Lincolnshire's Red Arrows will only be performing flypasts, and not their usual full display. "It has been assessed that the required changes to display heights and positioning would have reduced the visual quality of the display for the public to an unacceptable level and therefore, with regret, the Red Arrows’ will not be conducting a full display at Dartmouth this year." Hollywood star, Tom Cruise, says he wants to take to the skies with the Red Arrows one day.